I love these little Buddha-like faces smiling on these metal beads. I was inspired the moment I saw then and they reminded me of a story I used to love as a kid about the man in the moon. 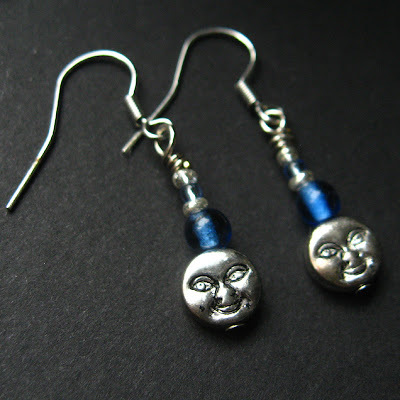 In this pair of handmade beaded earrings, I used these beads to create a touch of whimsy with man in the moon smiles at the end of a row of delicate blue glass beads and silver plated accents, all then set to dangle at the end of stainless steel hooks. Although I make a variety of handmade earrings, these are, by far, my absolute favorite and I even ended up making a pair for myself! These earrings measure at 1.45-inch (3.7 cm) and were made with care to be light-weight on pierced ears and easy to wear. 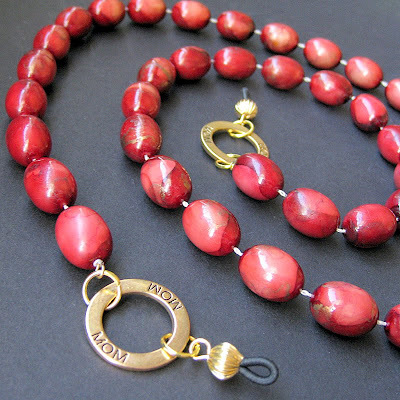 Once a beloved vintage beaded necklace made from red beads marbled with a hint of gold, when the necklace broke and it was handed down to me I knew just what to do with it. The piece that was once a necklace has now been turned into a beaded eyeglass holder that's perfect for the queen bee of any family and sure to make an impression. My mom's always losing her glasses, how about yours? This eyeglass holder is made of beads anchored on string with gold plated rings near the temples stamped with the word "mom" on either side. I think that we all forget sometimes that mothers everywhere need a little love now and then too. I love to imagine this unique OOAK (One of a Kind) piece being given to a loving mother as a gift and I think this piece makes for a perfect way to show her just how much she means. This handmade eyeglass chain measures 33.25" from tip to tip (84.5 cm). When I made this piece I was looking forward to autumn's full glory with the changing of leaves and pumpkins in the stores. Although the piece can be worn year round, I think that for fall fashion, this is the one piece in my shop that is absolutely perfect for the season. 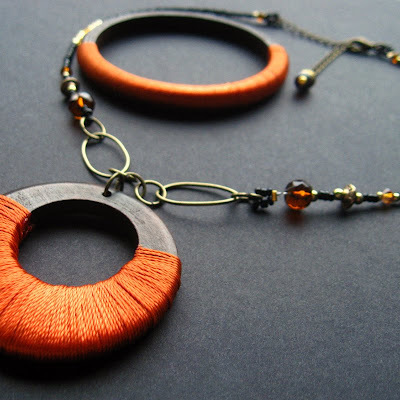 A dark wooden pendant coiled in the silky shine of vibrant orange nylon fiber dangles from a beaded strand of black in this handmade necklace perfect for the season. The pendant is then combined with glass beads in matching hues and bronze accents that combines elegant with earthy. The necklace is then accompanied by a beautiful matching bangle bracelet of the same shades of dark wood and vibrant shimmering orange wrap. The lobster claw clasp at the nape hooks to an adjustable chain that allows this necklace to be worn tight enough to be a choker or loose enough to lie against the chest while a small bead bauble at the end of the chain gives an extra bit of decorative touch. Necklace length adjusts between 16.5" - 19.5" (42 cm - 49.5cm). This set is part of our "Fiber and Wood" series of necklaces, bracelets and sets.